Parents come armed with the instinct to keep their little one safe at all costs. It is this instinct which leads many new parents to make sure they’re as up-to-date as possible on matters of infant safety. Now, researchers from Bristol University are offering up advice that could be useful to parents of newborns. When fragile newborns are in the back seat of a car, the researchers say parents should limit the duration of their drive to 30 minutes or less. 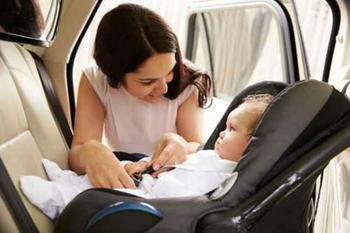 Infants who stay in car seats for long periods of time could be at an increased risk of suffocating, BBC News reports. The recent study, which used a simulator to mimic infants in a rear-facing car seat, found that an hour in the car seat caused signs of distress in newborns. Although car seat manufacturers say babies can be in car seats for up to two hours, the pediatricians behind the study say the rules should be different for infants younger than four weeks old. The researchers found that when infants stayed in the car seat for an hour, they exhibited signs of distress including increased heart rate and a decrease in the amount of oxygen in their blood. The neck muscles of infants -- which are still developing, especially in the case of premature babies -- could make them more susceptible to suffocation in car seats. There is little to stop their heads from flopping forward when the car is in motion, the researchers explained. To help ensure the safety of infants when traveling by car, the researchers recommend having an adult to sit next to the baby to monitor their breathing. Avoiding long car trips altogether is also recommended. “Restrict it to no more than half an hour or so, but try to avoid unnecessary car journeys for young babies,” Dr. Peter Fleming, a pediatrician at Bristol University, told BBC News. To expand upon this study's findings, Fleming has called for a larger study to be carried out.